Play-Off Semi-Final - 1st Leg. Thursday 3rd May 2012. And so after the weekends trip to london, the roller coaster ride continues with the first of the play-off semi finals, away to Cardiff City. I leave work late and it seems like every set of traffic lights are red, but make it into the meeting a few minutes after kick-off. 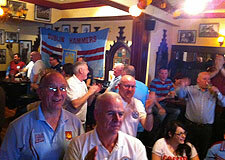 The place is crammed, all the usual faces, a few from days gone by and some new ones! As my guinness settles West Ham take the lead! A shot from Collison hits a defender, it bounces straight up in air, and Jack heads it in as it drops… a good start then! I finally get a seat on the presidents table, he shows me the S.N.A. Support Not Abuse Campaign flyers he has been distributing! West Ham are all over Cardiff, and it wasn't long before they go 2 up, Collison again, his shot is deflected which leaves the Cardiff goalie no chance… I'm a little confused, Carlton Cole (my man of the match) is having a blinder… holding the ball up, chasing down defenders, beating players, tricks… it's all a little surreal! Collison, now on a roll, cuts inside on the edge of the area, looks up… goes to shot… but misses the ball completely… a classic fresh air shot… 'Hard luck old chap" was the S.N.A. approved response from members! Half time comes and goes with rounds of sandwiches and the hum of satisfied conversation. Cardiff come out and start to make a game of it, they dominate the early stages and make a couple of good chances, fortunately for us they can't finish and as the game wears on we come back into the game. West Ham should have scored more, great crosses from Matthew Taylor saw Cole inches away from converting, while Nolan headed narrowly wide. 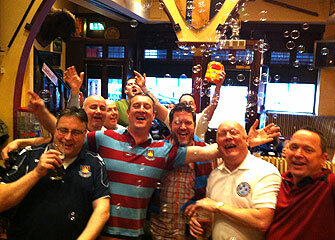 The final whistle blows and members join in a rousing rendition of Bubbles. A clip can be found on our facebook page. I can't help thinking we should have scored a few more, we certainly had the the chances… I wasn't the only one who thought Cardiff were there for the taking last night. They now have no option but to 'go-for-it'… a 'what have we got to lose' attitude, which with our jittery home form could spell a nervy 2nd leg at Upton Park! I have to say the presidents S.N.A. campaign certainly made a difference, however… we won… it was a good performance… Carlton Cole (the player who normally gets 75% of all abuse) was outstanding… was it really tested! 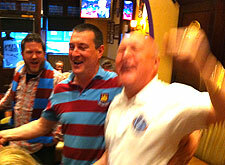 A good evening, great atmosphere, good result… COYI’s! Play-Off Semi-Final - 2nd Leg. Monday 7th May 2012. 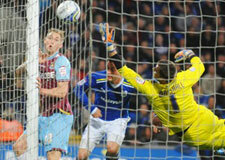 West Ham 3 vs Cardiff City 0. 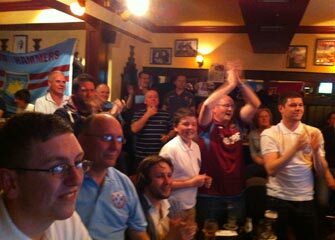 A great turnout in high spirits saw the Hammers book their place in the play off final with a stomping 3-0 win over Cardiff City. With the Irons shaky home form we wondered would we have any fingernails left come the end of the game, but the team looked up for the game right from the off. 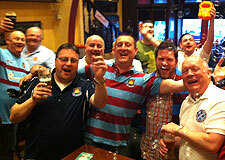 The early(ish) goal by Kevin Nolan after 15 minutes (Que mass chicken impressions from members!) eased all our nerves and we settled in for a fun filled afternoon. We kept pressing for more and managed to keep it tight at the back. 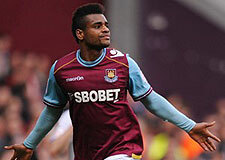 Just before half time Vaz Te nailed a second with a fantastic strike which meant it was party time in Brannigans. Liamo sent a text to the President to say “no mocking the secretary at half time” (Que everyone trying a Liamo impersonation! ), Gerry Nolan (who we have just discovered was rejected as a Nolan Sister some years ago) told us that Kevin Nolan lines out for the Dubs on Sunday hence some of his wild shooting over the bar. 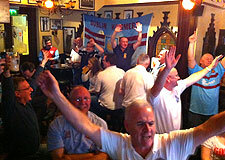 Tommy 4 had brought in a bubbles machine and we all sang “We’re off to Wembley” except Jimmy Conway who is going via Birmingham. It will be some laugh if they get to the final and Jimmy has to share a carriage with them for the day! 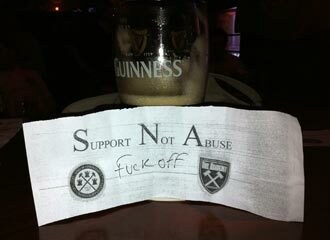 The SNA campaign worked a treat as one of the leaflets was stuck up on the TV. Mick from London (over on a golfing trip – it’s a hard life) enjoyed himself and managed to eventually answer the President’s WHU question. Pat got his passport back after the trip but was disappointed to see that the photo had been kept. The sambos arrived and were wolfed down in double quick time. At the final whistle there was much celebration and optimism among members and for once this season we felt that we had played to our strengths and more importantly kept a clean sheet again. At one stage we were visited by a manure slug who slid up to the table and showed us the logo on his hat and started murmuring something about league titles etc… we suggested football was all about the people and the craic and if we won anything all the better… he slid off into the night unable to comprehend why we hadn’t been impressed by the logo on his hat… I wonder if he’s ever been to manchester? 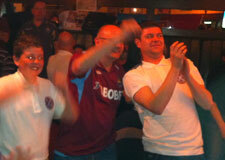 I staggered out of Brannigans at about 8.30pm and the party was still going strong at that stage! Overall a great day and lets hope we have something to celebrate on the 19th! Reports and photos by Gerry Murtagh & Paul Smith.